Top to bottom: Emory University Hospital, Emory University Hospital Midtown, Emory Saint Joseph’s Hospital. According to a new study by Market Strategies International, Atlanta residents believe Emory University Hospital is the best hospital in the city for health care. 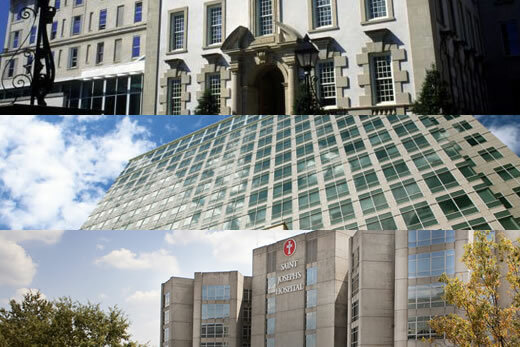 Emory Saint Joseph’s Hospital and Emory University Hospital Midtown were also perceived as top five hospitals in the area. Market Strategies recently released its Hospital Brandscape report in four major markets, including Atlanta, to help hospital executives better understand how consumers perceive their brand. Hospital Brandscape rankings are derived from performance on 19 hospital attributes, in categories that encompass a comprehensive view of consumer perceptions. Some of those include: perceptions of quality, care and treatment, institutional mandates, non-medical advantages and key service lines. The web-based survey was conducted across a representative sample of nearly 2,000 insured residents in each market. Markets are defined as the area within 10 miles of major hospitals or medical centers. Besides Atlanta, other markets selected for the first wave of the study were Boston, Chicago and Philadelphia.